A frequent task when changing phones or platforms is transferring data. In addition to this special events, it is strongly recommended to backup your lap data regularly. This how-to covers both scenarios and adds some details on LapTimer's storing scheme. The app itself and upgrades need no backup. Both AppStore and PlayStore allow you to install the app from scratch without being charged again. The only and important thing to know here is app licenses and upgrades are bound to your Apple / Google ID. As long as you keep it, you can reinstall the app for free. Never change the id please! In case you upgraded your initial app edition using In App purchases, make sure to follow the initial order of installation. As an example, a user who bought Petrolhead from the store and upgraded it to GrandPrix later, needs to go through these steps to restore the app itself: load Petrolhead from the My Apps section in the AppStore / PlayStore app; start LapTimer, navigate to Administration ‣ Add-ons ‣ GrandPrix Upgrade, and "purchase" the upgrade again. The system will prompt you to agree to be charged. Agree here, you will get a message later you had bought the feature already and are not charged again. For iOS, there is a Restore button available in Add-ons automating this repurchase. App settings are saved and restored using the platform migration tools only. There is no other option, but the amount of settings to enter during a "restore" is usually very small (Driver ID and some individual settings). Restoring certified track sets is easy - just load them from Add-ons again. User track sets are bit more complicated: for track sets defined e.g. by using the New Autocross assistant, navigate to Lap List first. Scroll to the section showing the laps recorded for the user track set. Select the first row in this section (User Track Set). Scroll to the bottom of the list of POIs and press Certify for iOS, or select the Certify action from Android's options menu. Generate the mail usually sent to us for track set certification. 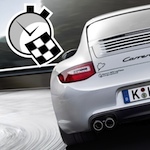 Change the "to" address to your own email address and remove Tracks@gps-laptimer.de. Keep the mail as the backup. To restore it later, touch the .hpoil/.hpoiz attachment from your mail app. This will reinstall the user track set. Data recordings are usually the most valuable data you want to restore. Our recommendation is to create a backup of your lap data after each track day. It is easy and fast: start LapTimer, navigate to Lap List and scroll to the bottom of the list and press Transfer / Export Lap Data (iOS) or press the Export icon on the top right (Android). You will see LapTimer's Export Dialog now. Select All for Lap and Type Selection, and select .hlptrl as export format. Disable all other format buttons. Select Mail to send a mail to yourself. Keep the mail as the backup. To simplify the process, you can enter your email address in LapTimer's Expert Settings (Export / Default E-Mail). The .hlptrl files generated include all laps and data recordings plus vehicles defined. Footage is not included and needs to be maintained separately. To restore data recordings, open the mail generated during backup on the phone you want to restore the data to. Touch the .hlptrl/.hlptrz attachment and select LapTimer as the app to open it with. In case the mail is not the original mail generated during backup (and in case you are using Android), it may be necessary to open the attachment in a different way: download the attachment from your Android mail app first; install the ES File Explorer app from PlayStore; start it and touch the .hlptrl/.hlptrz file in the Downloads folder. In case you want to backup and restore video recordings, please check the section Maintaining Video Data in http://www.gps-laptimer.com/LapTimerDoc ... hapter.pdf. Shortcuts: for iOS, connect your iPhone to your PC, start iTunes, select the iPhone in top left, select Apps, scroll down to File Sharing, select LapTimer. All files shown ending with .mov are you video files sitting in LapTimer Recordings. You can copy and move this .mov files around as required. You can restore videos later by simply dropping them into iTunes / File Sharing / LapTimer. As long as you do not rename the file, links and sync information will be kept. Videos stored in the Photo app can be maintained using iTunes sync etc. For Android, videos are mostly stored on SD cards. Backup and restore can be done using standard file management. O.k., this has been the full story. Both Android and iOS come with backup solutions too. They will usually include all LapTimer data discussed. However, it sometimes doesn't work and it is "all or nothing" for your complete smartphone. Items listed here add by far better control. The single and most important take away is probably the Data Recordings section and the test highlighted in red.